Home › Games › Farewell Faire, Foam, and F@%#ing horn car! Well, the Detroit Maker Faire is over and I had a blast. Thanks to everyone who played a game at the Open Source Games booth from Austic Labs. 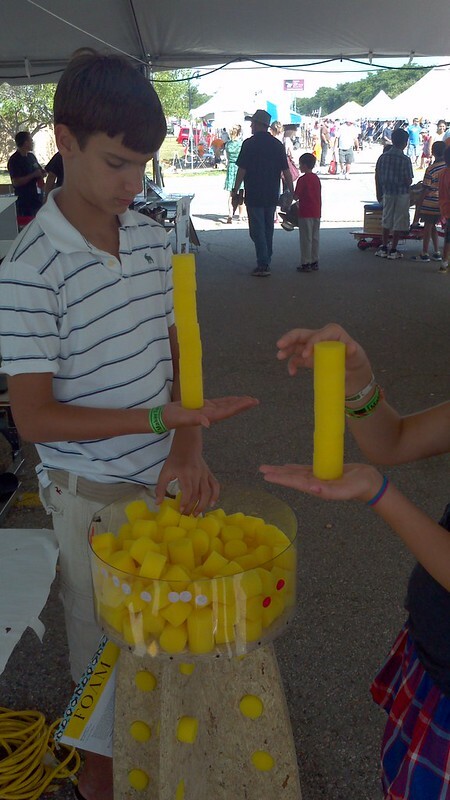 I had a fantastic time meeting people, thinking of trivia questions, stacking foam (18 high, my personal best! ), and solving big ticket problems from the Appropriate Technology Collaborative. We had a total of 68 answers to the 4 Maker Challenge questions provided by John Barrie at the Appropriate Technology Collaborative. Results to this challenge will be out in the next few weeks, so stay tuned to see if you won an Arduino. If you thought this was a cool idea, please please please go to the next App. Tech. Meetup and put your big brain to work on empowering others around the world through technology and education. Go here for all the answers for the Maker Challenge and go here for more details about the game. Thanks to your fabulous host, Rachel McGuffin! 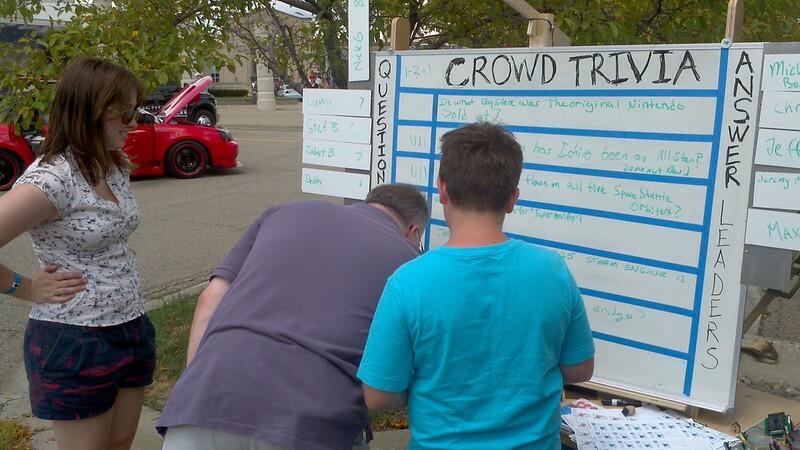 51 groups of people (probably ~150 people total) played Crowd Trivia and they generated slightly over 51 questions. Most points went to Steve D at 28 - congratulations Steve! I'm going to try to analyze this data in an interesting way soon, but for now go to the Flickr page for pictures. If you like this idea and you have programming skills and a desire to help, I really want to create a evernote app to automatically upload the picture and use OCR (optical character recognition) to pull the questions off the board and on to the web. This is useful for Crowd Trivia, but is also generally useful for many other things (scientists sharing data on their whiteboards, Agile developers sharing immediate data from their storylines off their walls, etc.). Shoot me an email at greg@austiclabs.com if you think this is as good an idea as I do. ~ 20 - 40 child-hours were spent stacking foam, shooting marshmallows at foam, throwing foam at each other, or seeing how much foam they could squeeze into their little hands We created a few new rule sets so if you need those little pieces of foam please go to an great little store in Ann Arbor called the Scrap Box. While your there, stop by Maker Works and/or my office which is just next door. And last but not least, we gave out 125 sticker badges and more than 47 badges by email as part of our continued beta testing of Mozilla Open Badges and www.badg.us at events. If you don't know what badges are, they are going to change the world for the better (especially for Makers) and here's why. If you want to help make badges more accessible and you know how to program in python, check out the open source project www.badg.us or go here to get more info - we need help! My hope is everyone that came to the booth went away thinking about how they can create amazing games and systems in their life and work which are fun and maybe even useful.